If there is one field in design that requires a huge amount of drawing talent, imagination and creativity, that’ll be creating matte paintings. A matte painting is a visual representation of any given place, real or imagined, that is too expensive to recreate or simply too far away to visit. Such artworks are necessities in creating realistic backdrops for films and some TV series. Even big budget films depend on matte painters to create such settings. In truth, it has saved many viewers from boring, poorly-devised backgrounds and film producers from unnecessary overspending. Right now, let’s take a plunge on some astounding samples. 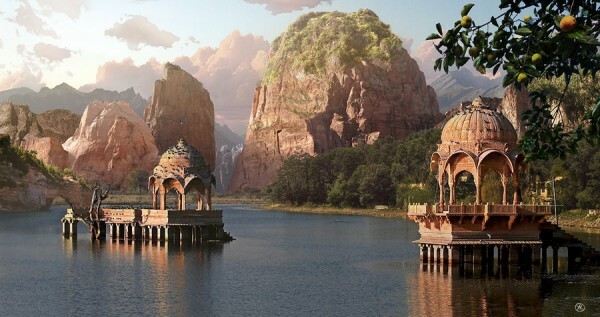 Here are 60 incredible matte paintings that I’m sure will take your breath away. Not into film? Why, these artworks are perfect for backdrops for your home and office as well! Why not try putting such artworks on poster prints and photo enlargements? I tell you, these will be pretty spectacular.